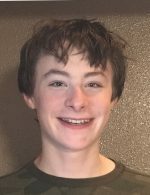 Bjorn Keller, 14, began riding on a dog sled at six weeks old, riding in his grandma’s arms returning home to McCarthy. He grew up in the bush, on a subsistence farm with goats, pigs, chickens, geese, ducks, and DOGS!! Bjorn is currently home schooled and plays in Little League Baseball and competes in “Magic: the Gathering” tournaments. (Magic: the Gathering, is a trading card and digital collectible card game.) After high school, he plans on winning the pro tour in Magic: The Gatahering. And he says he does plan to continue mushing.